Versatile third baseman Josh Harrison will miss seven weeks after undergoing surgery for a torn ulnar collateral ligament in his left thumb, the Pittsburgh Pirates announced on Wednesday. Harrison’s injury arrives in the midst of his team’s eight-game winning streak that has lifted it within four games of the St. Louis Cardinals in the National League East with a 50-34 record. Pittsburgh currently owns a 3.5-game lead in the NL wild card race. The Pirates are also without outfielder Starling Marte, who left Sunday’s game after feeling discomfort between his ribs and left oblique. Marte has not been placed on the disabled list. Harrison, who celebrated his 28th birthday on Wednesday, is batting .279 with four home runs, 22 RBI, 20 doubles and nine stolen bases this season. He has played 56 games at third base, 18 at second base, 10 in right field and three in left field for manager Clint Hurdle. Travis Ishikawa, last October’s post-season hero for the San Francisco Giants, replaced Harrison on the Pirates’ active roster. Pittsburgh claimed Ishikawa from the Giants, who designated him for assignment. Jung Ho Kang, who was signed as a free agent out of South Korea last offseason and is hitting .259 with four home runs and 26 RBI for the Pirates, is projected to see a bulk of the playing time at third base while Jordy Mercer will likely occupy shortstop. Kang also plays shortstop and second base, but he is the most productive third base option for the Pirates, who also have Sean Rodriguez and now Ishikawa (who plays the corner infield spots and right field). Veteran Steve Lombardozzi is also on the roster, but he is best suited as a utility man. Pedro Alvarez has experience at third base, but he has transitioned as the club’s starting first baseman. 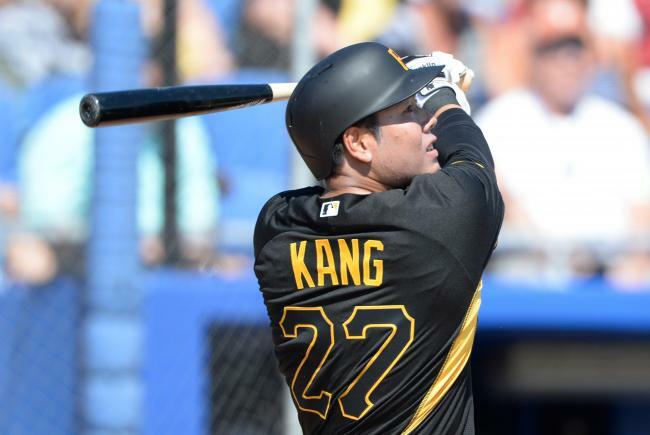 Considering Kang’s versatility, and the projection that Harrison will return around the end of August, the Pirates could choose to fill the third base spot from within for the entire duration of Harrison’s DL stint. Since Pittsburgh has inched closer to St. Louis in the NL Central race, though, it could make a deal for a third baseman by the July 31 non-waiver trade deadline.